The documentary Itzhak is a wonderful new cinematic portrait of the many-faceted violinist Itzhak Perlman. Perlman was well described by former President Obama who said, when presenting him the Presidential Medal of Freedom in 2015, "This is a man of large appetites who knows how to live...But what truly sets him apart and what makes him perhaps the most beloved violinist of our time is that he approaches music the way he approaches everything in life -- with passion and with joy." I was lucky enough to see "Itzhak" when it debuted in Washington D.C. on March 6. 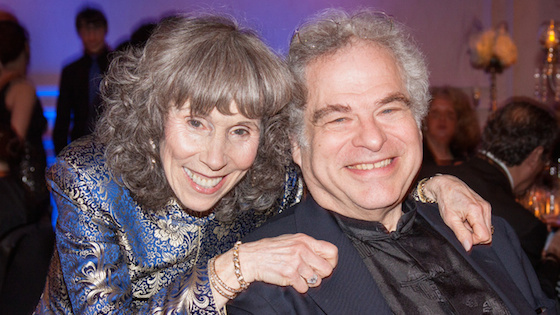 I had background knowledge about the film because I had read Laurie Niles' blog Inside 'Itzhak': Interview with Alison Chernick about Her Documentary on Itzhak Perlman. I found that everything Ms. Chernick said in the interview was expressed in the film. The film, however, was much more eloquent and emotional than her verbal description. After all, Ms. Chernick is an accomplished film producer, rather than a speaker. Perlman plays many roles well. We all know him as one of the world's best classical violinists, but he is also a magnificent player of other kinds of music. The film has clips of him playing concerti and chamber music, "Take me out to the Ball Game," "Schindler's List," "Allentown" with its composer, Billy Joel, and the national anthem. He plays them all with dignity and infectious emotion. Here is Perlman, dressed in a Mets jacket, playing the national anthem at a Mets ball game. Finally the great violinist Isaac Stern brought the 13-year-old Perlman to the U.S. and persuaded Ed Sullivan to feature him on his TV show. The whole world was astounded with his consummate playing. Perlman was then admitted to the Juilliard School of Music, where the great educator Dorothy Delay took him under her wing, teaching him violin, getting art lessons for him, and overseeing his entire education. Unlike his earlier teacher, Ms. Delay treated him with great affection, calling him "Sugarplum." She refrained from imposing her musical opinions on him and encouraged him to develop his own artistic aesthetic. She never even criticized his intonation directly, saying instead things like, "What is your concept of G sharp?" She was radically different from from Perlman's childhood teacher, and his reaction to Ms. Delay was to hate her. In time he appreciated the wisdom of her approach, and when he taught, he used her methods. He said that his years of teaching at Juilliard made him develop and mature as a musician because when you teach, you must listen carefully. He became well known as a superb teacher. An important part of Perlman's life is Toby, his soulmate and wife of 50+ years. She is intelligent, articulate, musically informed, vivacious, and very devoted to Itzhak. She said that it is not unusual for a wife of many years to love her husband, but it is rare for a wife to respect him. She does both and is his helper, critic, support person, and kindred spirit. The two first met at a summer violin camp for violin students (she is a Juilliard-trained violinist) in their teens. She was so strongly affected by his playing the first time she heard him at the camp that she proposed to him as soon as he finished playing . He did not say "yes." She had to wait for a few years for him to agree to marry her. Then she loved and supported him as a violinist while they raised five kids. In 1994 Toby founded the Perlman Music Program to support and nourish the next generation of string players. Of course, her husband was drafted as the lead faculty member of the summer music camp and other programs. As Toby directed, The PMP leaders strive to create a music learning environment characterized by support and nurturing instead of intense competition, as is found in many other programs. One of the PMP alumnae interviewed in the film said it was "the happiest place on earth." Toby has been a supporter of her husband as well as music and music education in her own right. Perlman's Jewishness was important to his film maker, who portrayed it well. Perlman grew up in Israel and returns frequently for performing, teaching, and just revisiting his roots. In the film he spoke about the many important historical and cultural characters in the history of Israel and said that one could learn a great deal about them by doing a "Jew-gle" search online. In conversation with Toby, Perlman complained that his mother was a very negative person who never believed in the inherent good will of people, Toby reminded him that his mother was from Nazi Poland, where she was constantly exposed to the very worst in people. Violin music at Auschwitz was the subject of a conversation between Perlman and an Israeli luthier in the film. The Nazi camp leaders seized the violins of Jews coming into the camp and had inmates of the camp play these violins for the camp directors' own enjoyment. Perlman's luthier said that these experiences were enormously important to the Jewish violinists because these poor individuals could escape from Auschwitz for a few minutes by playing music. Some of the many factors of Jewishness in Perlman's life were brought together in the final scene of the film, where Perlman is celebrating Passover with his family, drinking wine and singing some of the traditional songs of the Jewish holiday. 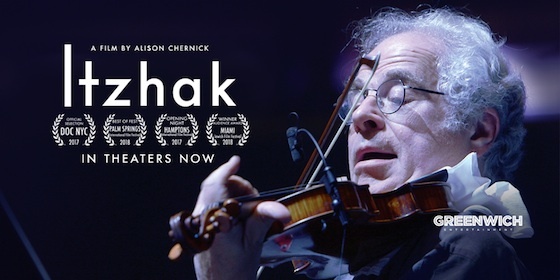 The film "Itzhak" will be shown in movie theatres around the country starting this spring and on PBS's American Masters series this October. Please don't miss it! March 26, 2018 at 03:29 PM · This is a great review! I wish the movie were coming out closer to me. SF and Berkeley are quite a schlep. So I will probably wait for the DVD/Netflix. March 26, 2018 at 04:40 PM · Karen, it will also be on PBS, so that's another possiblity!